Concessions of £2 per ticket are available for most shows and screenings for Under 16s, 60+, Students, Jobseekers, Disabled Patrons and Companions, and Groups of 10+. Please check our Access page for full details on tickets for disabled patrons. Additional concessions are available for certain shows and screenings, including family tickets (max. 2 adults). Full details are given when you select your seats to book. Restricted View tickets are available at a reduced rate for some performances and screenings. Children aged 18 months and above will require a ticket to attend the majority of our shows, while those under go free. However, when a show is aimed specifically at pre-school audiences, children will require a ticket. Please contact our Ticket Office for advice on a particular show if you are unsure. 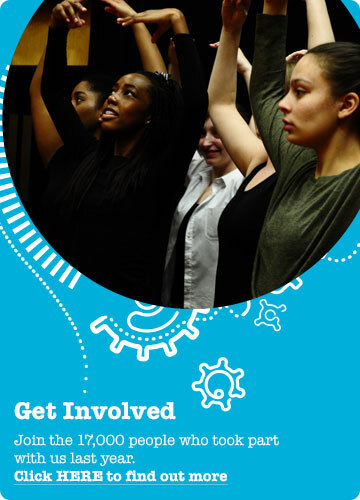 If the cost of taking part in a Get Involved activity is a barrier, please speak to us and we will check if you are eligible for one of our bursaries. Email [email protected] or call 01536 470 473 for more information. Young people aged 16– 25 can also access discounted tickets for a variety of shows through our Real Discounts scheme. Visit or call our Ticket Office on 01536 470 470 to sign up to and book with Real Discounts. All concessions are subject to availability and should be checked at time of booking. Proof of status will be required. Groups of 10+ can also receive a concession on their ticket in line with the above. Further discounts for Groups of 20+ and Schools are also available on certain shows and films – please ask the Ticket Office for details. Our Partner Schools receive enhanced discounts to the regular schools rate. To find out how your school could work with us, please click here. Group packages are available for food and refreshments to suit all budgets, from private spaces for interval drinks through to pre-show buffets. For further information please email Lucinda Hill or call 01536 470472. All concessions are subject to availability and should be checked at time of booking. Proof of status will be required.